No Salt. Small Size. So Good! Noodles that are simple and easy to digest. Easy one pot meals! 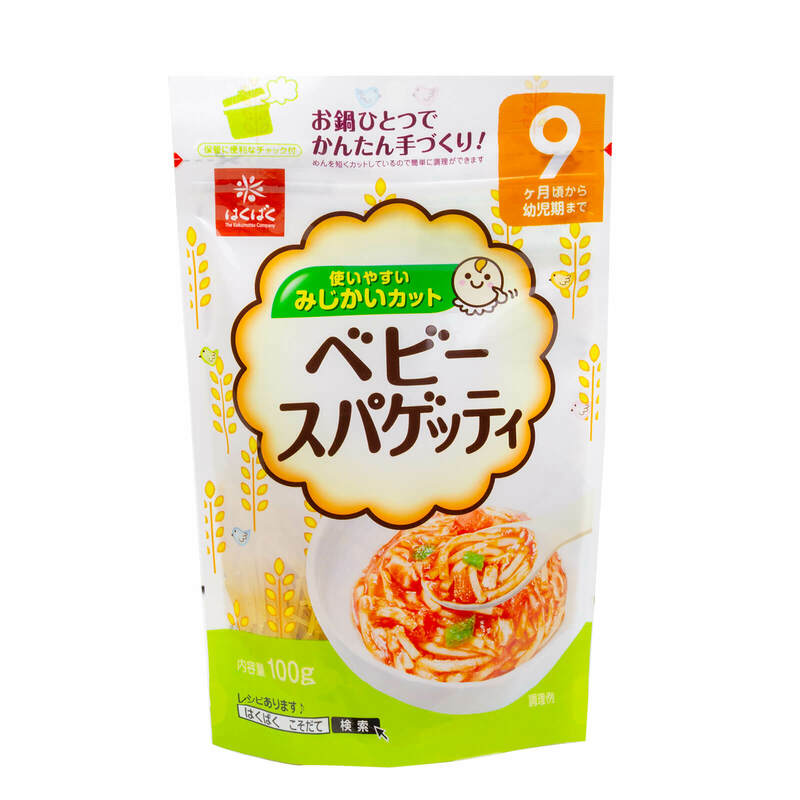 Hakubaku Baby Noodles: Somen, Spaghetti and Udon are great for baby's first noodles. No salt added, nothing artificial- just good wheat noodles that are easy to eat. Small 2.5cm noodle sizes are great as a soup or mixed up with veggies and meat. Great for little hands to hold and eat as well. 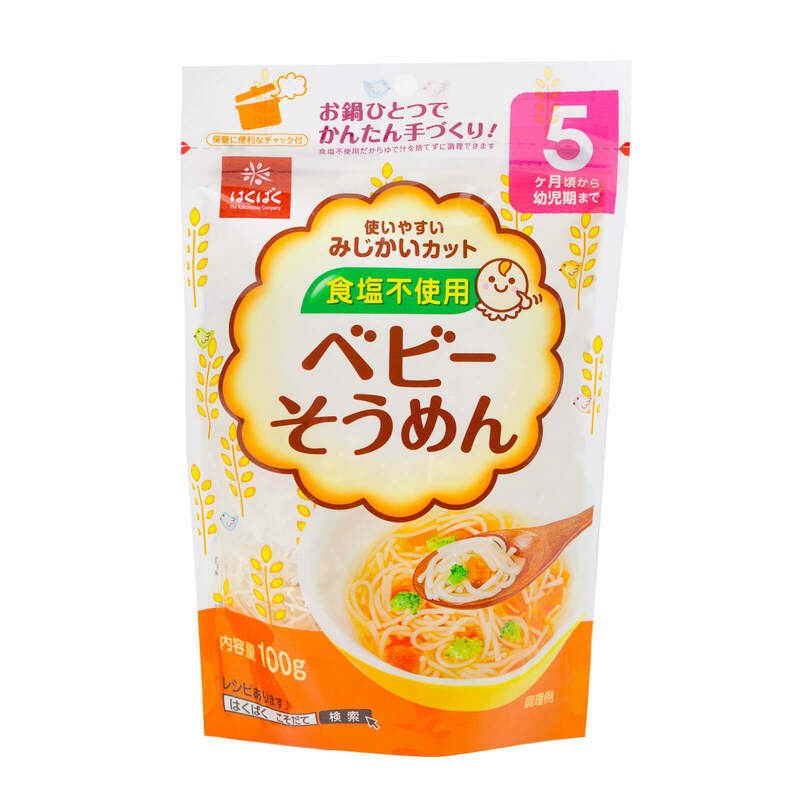 Hakubaku baby noodles are the best way to introduce baby to their first solid food. Made for children 5 months and up to 9 months and up. The month guide number clearly marked on every package. Easy resealable zipper pouch for storage and self-standing too! 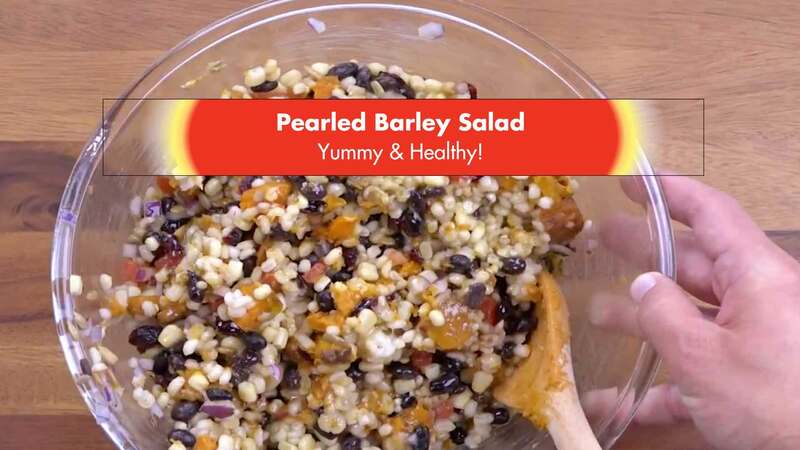 Use in stews, soups and stir-fry dishes or anywhere you want to make something yummy for baby! Made with NO SALT, our noodles easy to use in a one-pot dish for quick clean ups. Used by moms all over Japan for generations. Our Somen, Udon, and Spaghetti baby noodles are favorites all over the world. Baby Noodle Products for Every Age! Best wheat for great taste. For childern 5 months and up. 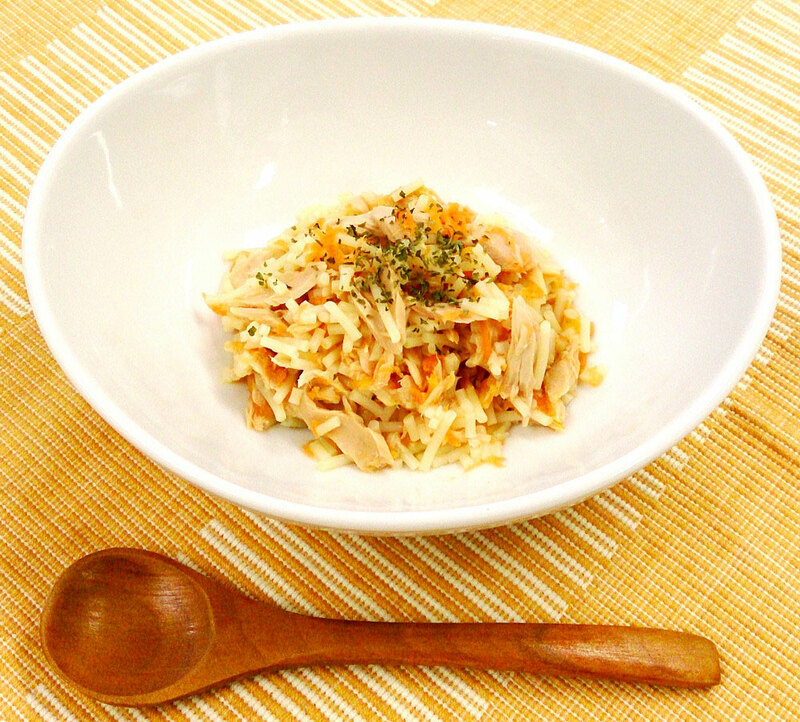 Made with No Salt from premium Japanese wheat from traditional recipes. makes it easy and good. For little ones 7 months and up. Small noodles and NO SALT makes this Udon easy to make. Picks up any flavor you add to it. Our NO SALT spaghetti baby noodles are great for baby's first introduction to Italian food. Made to stand up to sauces and little fingers! Easy 1-pot meals means easy cleanup. 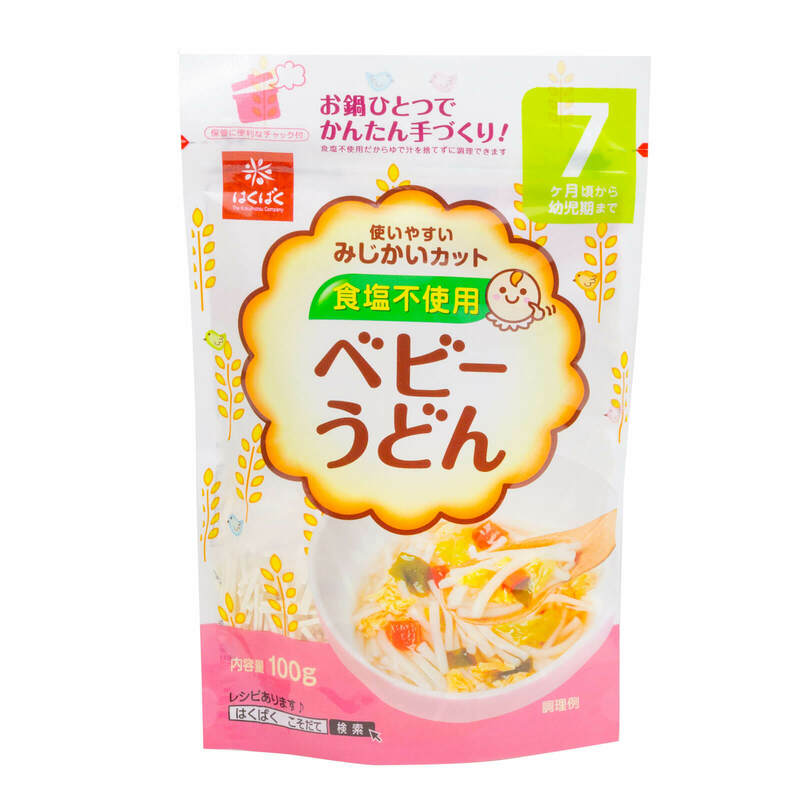 Hakubaku Baby Noodles have No Salt for Better Health! Did you know some ordinary noodles may contain salt for preserving and creating chewy texture, and salt can remain after its cooked? The US FDA recommendation is 2400mg per day for a 2000 calorie adult diet, which is still too much salt for a baby. Hakubaku’s noodle technology makes it possible to produce high quality, flavorful noodles with a chewy texture without adding any salt. It is a healthier choice for a baby! Baby noodles are pre-cut to 1’’ long, a small size that is perfect for a young baby’s mouth. No more worries, as these small noodles make eating and cleaning up a breeze should any fall on a baby’s clothes or on the floor. Since the noodles contain no salt, one pan/pot cooking is possible! The same water used to cook the noodles can now be used for making soup without making it too salty or destroying the original taste of the soup. Answer this question and get your offer! What foods do you enjoy most? How would you use Mochi Barley?